The Pulaski Senior High School Concert Band presented an instrumental music concert, directed by Jack Jennings recently. The final band concert for the school year, the musicians presented an outstanding show for their final high school performance. Band Director Jack Jennings donned his own “eighties flashback” letterman’s jacket from when he was a student at Pulaski High School for the final number at the recent high school instrumental concert at the school. The song, entitled “Eighties Flashback” featured a medley of popular songs from the 1980s. During the concert, Jennings allowed all four of the Novak children to be on stage as a way to say thank you to the Novak family for their support of Pulaski Marching Band over the years. A special tribute to classic rock legend Led Zeppelin featured a medley of many of the songs that made the band famous, culminating in the iconic tune “Stairway to Heaven.” The performance was a treat for young and old alike. 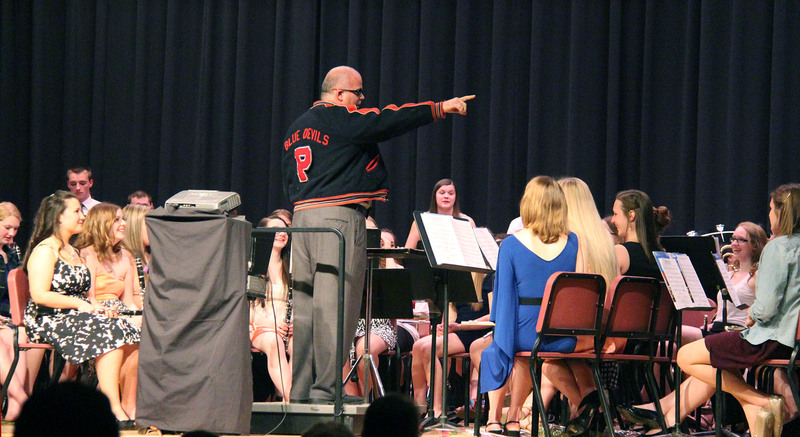 During the concert, Jennings recognized and honored senior band members and each musician was called forward and presented them with a special memento of their time with the Pulaski High School Band. Seniors honored at the concert included: Chris Cushing, Larry Halsey, Joe Falciatano, William Delgado, Jacob Nicholson, Leo Marino, Nick Hollis, Jadon Powell, Mike Visco, Jimmy Carnes, Eric Rumble, Callie Wilson, Taylor Hitchcock, Emma van der Heide, Ruth Clark, Jessica Pastuf, Shelby Sheehan, Kathleen Kinney, Amber Roberts, Jacqueline Novak, Kathryn Paye, Miranda Edick, Katy Southwell, Rebecca Hall, Annie Forestiere, and Margery Skilinski. Student representatives Larry Halsey and Jessica Pastuf presented Jennings with a token of the seniors’ appreciation in an emotional moment that ran the gamut from laughter to tears. They also shared some of their favorite Jennings’ famous sayings such as, “You guys just played the snot out of that!” when the band played particularly well, and when they didn’t – “leave class, go sign up for home ec and bake a freaking cake instead.” To which Pastuf noted that they had “baked a freaking cake” to honor Jennings and would have a reception in the cafeteria following the concert.